If you would like to capture more (or different) information than what is standard on the Contact form, you can add Extra Values to the form. These can be any of the various types of EVs - Header, Integer, Date, and so forth. These Extra Values will display in a section just above the Comments. The purpose is to give you the flexibility to gather information that is not already in the existing checkboxes. And, it allows you to capture that information in a format other than having all the information in the Comments section of the Contact. 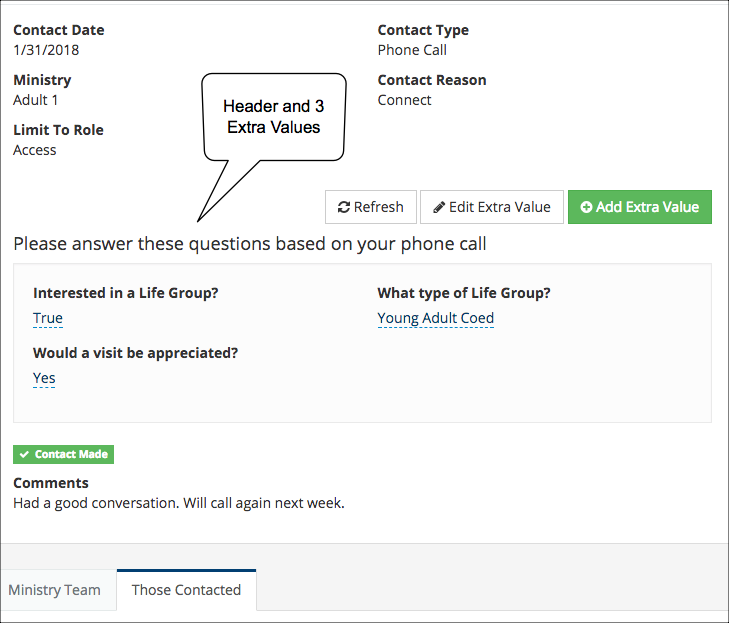 When adding Extra Values you determine which specific set of Ministry, Reason, and Type on a Contact will have which Extra Values. This set is referred to as the location of the Extra Values. In the above image, the location is Ministry name = Adult 1, ContactType name = Phone Call, ContactReason name = Connect Only after those 3 items are selected will the Extra Values display. We have some sample text below that you can copy and paste into your database. After you complete the steps below to create the locations for the Extra Values, these locations will display not only in the new xml file you will create (in Step 2 below), but also in the Text File named StandardExtraValues2 in Special Content. You do not need to create or edit that file; that one gets edited when you complete Step 3 below. You can also create Extra Values to display on every Contact (except the locations you have specified in the file created in Step 2). These will have a ‘location’ named PersonStandard See the note below regarding these types of Extra Values. You do not need to include this location in the ContactExtraLocationConfig file. These become a sort of default. If you are not familiar with Extra Values, you can read more about the types of Extra Values in this article. Create a new Setting named Feature-ContactExtra and set the value to true. This is done by going to Admin > Setup > Settings and clicking the green +Add Setting button. This Setting is required in order to turn on this feature. Create a new xml file named ContactExtraLocationConfig.xml . This is done by going to Admin > Setup > Special Content > Text Content and clicking the green +New Text File button. The content of this file will be the locations mentioned in the top section of this article. You can copy the sample code below and paste it into your new xml file and then just edit it if you’d like. See sample xml file below. Only a user with Admin role can create the Extra Values as described below. However, once they are created any user that is recording a Contact will see those Extra Values and be able to enter the values (unless they are protected). 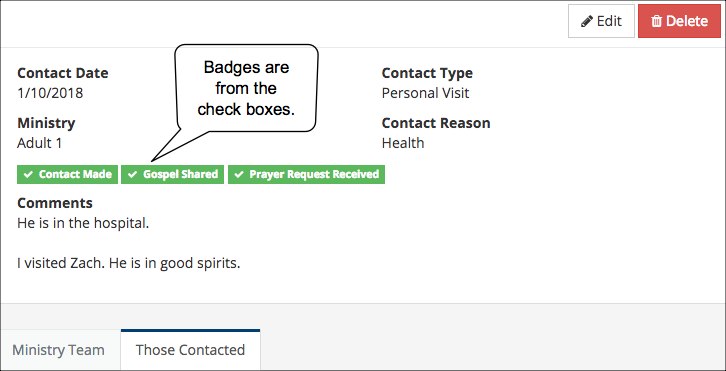 If you have ministers or volunteers making hospital visits, you could set it up so that when someone selects Pastoral Care Ministry and Personal Visit Contact Type and Health Reason when creating a Contact, the user will see specific Extra Values such as Possible Release Date, Hospital Room Number. Pastoral Care, Personal Visit, and Health are what make up the location for those 2 sample Extra Values. Now you will create the Extra Values you want to display when someone creates a Contact and selects a location you specified in the xml file. Go to a people record, select the Ministry tab, and click Add Contact Made to this Person. Select the Ministry, Reason, and the Type you specified in the xml file. Click Update. Now click Add Extra Value and create the Extra Value(s) you want to appear every time a user selects the specific Ministry, Reason, and Type for one of the locations in the xml file. Each location can have multiple EVs. Add those during this process. Repeat Steps 3a & 3b above for each set of locations included in the xml file. Communicate with your staff and lay leaders to let them know what is expected when they record a Contact. Explain the purpose of the Extra Values. You can create a Header type of EV in order to add an explanation or merely to make the Extra Values display more prominently. After you create the Extra Values, click Edit Extra Values and rearrange them as you wish them to appear. Click Apply Reordering. For example, put a Header in line 1 and so on. The others will display in order and in 2 columns. If you would like Extra Values to display on every Contact regardless of which Ministry, Reason, and Type are selected, you will create a new Contact (as in Step 1) but do not select any of the drop down fields for Ministry, Reason, or Type. Instead create the Extra Values. Because you create the EV without selecting a ‘location’ these will be Standard EVs for a person. They will display for all Contacts except those specified in the xml file and will display in the StandardExtraValues2 file with a location named PersonStandard.